President Trump wants America's trade deficit to get smaller, but it's going in the opposite direction. The deficit through May increased to $233 billion for the year, according to U.S. trade data released on Thursday. That's 13% bigger than the $206 billion deficit over the same time a year ago. Trade will be a central issue during Trump's visit to Germany for the G20 Summit on Friday. Germany's foreign minister warned this week that Trump could start a trade war with Europe. Trump has also criticized several G20 nations -- China, Germany, Mexico and Canada -- for what he calls unfair trade practices. And a potential trade war over steel still looms. Trump has often blamed bad trade deals for an exodus of U.S. manufacturing jobs. He claims that a growing trade deficit -- the difference between what the U.S. exports versus imports -- is a sign that other countries are taking money, jobs and companies from the United States. It's an argument he often cites to justify trade threats, like tariffs. In the first three months of this year, U.S. trade deficits with Mexico, Canada and China got bigger. The deficit with Germany was slightly lower compared to a year ago. In reality, a trade deficit doesn't reflect lost money, jobs or firms and they are not necessarily bad for the economy, experts say. Japan routinely has a trade surplus, yet its economy has stagnated for the last two decades. Australia usually has a trade deficit, and it hasn't had a recession in a quarter century. When the U.S. went into recession in 2007, the trade deficit shrunk. Conversely, when the U.S. economy was growing at a strong, 4% annual pace in the late 1990s, the trade deficit ballooned. Nevertheless, Trump has promised to clamp down on the trade deficit and not let it grow any bigger. Exports in May increased to $192 billion, the best month since April 2015. Exports rose this spring as a weakening U.S. dollar made American products cheaper for foreigners to buy and as the global economy picked up momentum. U.S. exports have to outpace imports in order to shrink the trade deficit. That's unlikely to happen anytime soon. 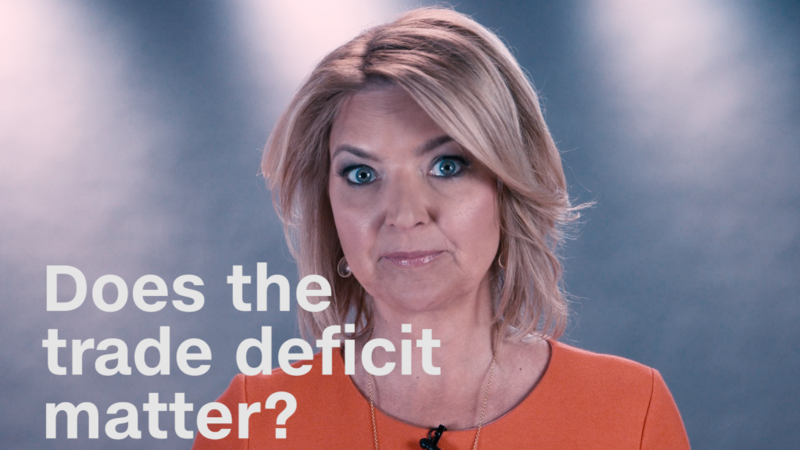 And as recent history shows, a shrinking deficit can reflect an economy getting weaker, not stronger.